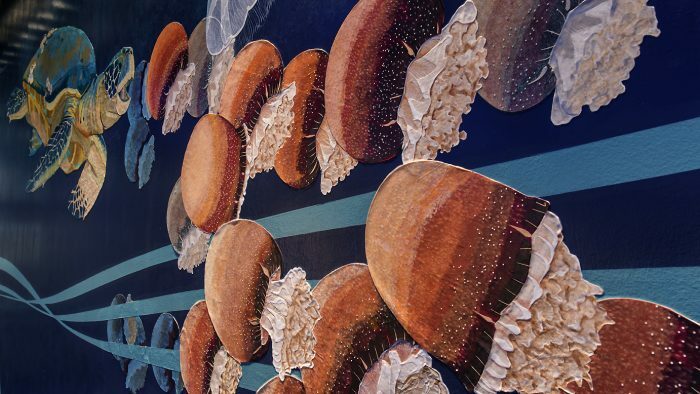 Jane Kim is a visual artist, science illustrator, and the founder of Ink Dwell, a Bay Area studio that explores the wonders of the natural world. Her art career began as a little girl obsessively painting flowers and bears on the walls of her bedroom. Kim received more formal training at Rhode Island School of Design and then Cal State Monterey Bay, where she received a master’s certificate in science illustration. 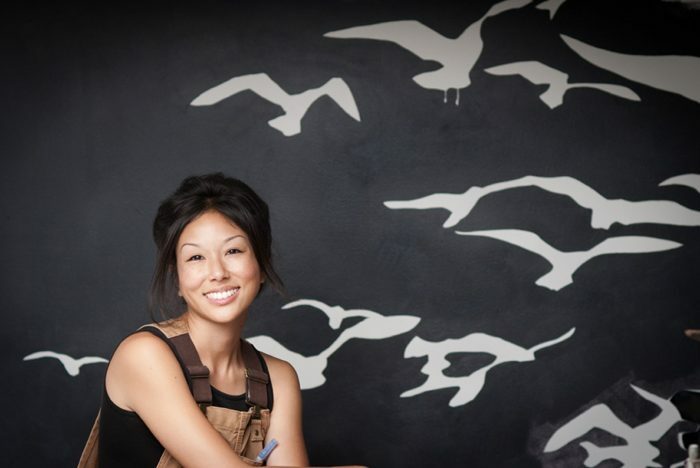 With Ink Dwell, she has created dazzling large-scale public art installations across the country, including the Wall of Birds at The Cornell Lab of Ornithology, works for the National Aquarium, the de Young Museum, the Nature Conservancy, the Smithsonian Tropical Research Institute, Facebook, Recology, and Yosemite National Park. She is the creator of the Migrating Mural campaign, a series of public installations that highlight wildlife along migration corridors it shares with people. 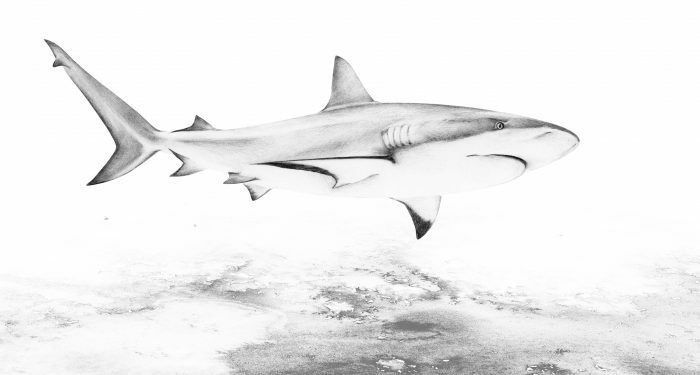 Whether swimming across an Aquarium or flying past you unexpectedly on an urban street, Kim’s work never fails to surprise and educate. She still enjoys painting flowers and bears, though nowadays she doesn’t get in trouble for painting on the walls. First off, how did you begin making the connection between art and the natural sciences? Are there any artists, scientists or other individuals who have influenced you on your journey? One of the important experiences for me in developing my voice came unexpectedly during a visit to the Page Museum at the La Brea tar pits There was an exhibit of bird skeletons, living and extinct species, and behind each skeleton was a gorgeous painting of the bird in the posture by John D. Dawson. As soon as I saw his work, I told myself I wanted to do things like that. Isabella Kirkland another artist I love whose work falls in the nexus of art and science. What does your journey look like in the beginning stages? How do you prepare and then execute such large scale murals? My process begins by determining the relationship between the architecture (my canvas), surrounding environment, and desired narrative. The shape and locations of the wall inform the concept as much as the subject. Is it a giant exterior wall smack in the heart of downtown? A more diminutive location indoors? With a setting like the former, perhaps I’ll want to create something monumental and impossible to ignore while, on a canvas like the latter, I might want the piece to surprise and delight. From there, it’s just a matter of taking the technical steps to bring it to life. 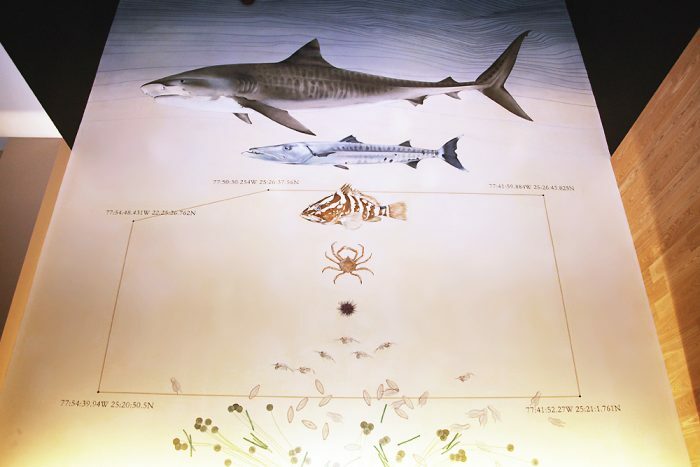 How was the experience of making the mural for National Aquarium and depicting animals you were working in such close proximity to? 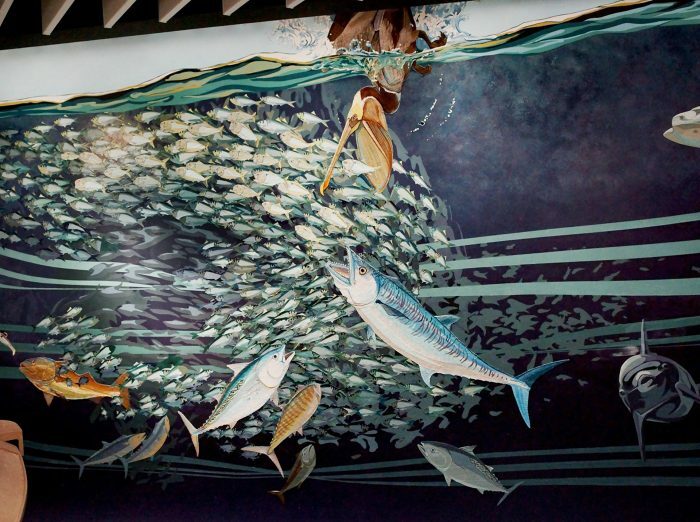 I tended to work odd hours creating the Living Seashore murals, which meant I often had the aquarium to myself. I could wander the hallways at night observing the shapes and behaviors of many of the animals I was creating, it was just me and the fishes. An artist couldn’t ask for better reference material than the opportunity to observe an animal up close. Often times, if I’m creating work about the natural world in an urban environment I’m removed from the subjects I’m painting, but working at the aquarium I felt like I was actually part of the Atlantic Ocean’s nearshore ecosystem. In your video for the National Aquarium, you talk about wanting to create a connection between people and nature through art, do you have a vision for how you would like this relationship to evolve? Representational art is a foundational part of the human condition–it’s one of our earliest languages, even dating back to cave paintings tens of thousands of years old. When an artist decides to depict a certain subject they are declaring that subject important, something worth paying attention to. I hope that my work will educate and inspire people to develop a deeper relationship and understanding of the natural world. Lastly, how do you hope someone will experience your work? If you could make people feel one thing what would it be? I hope that my work will elicit wonder and curiosity. At a time of extreme disconnect, artists like Jane are bringing the beauty of nature back into our visual lexicon, reminding us all of what is at risk, and everything we have to save. To delve further into their world, Ink Dwell has recently created a book documenting their great Wall of Birds mural, the only mural in the world to showcase all 243 families of modern birds painted to scale. The book describes how these birds evolved, and how the mural evolved from their story. You can also see more at Inkdwell.com or check out the links below!